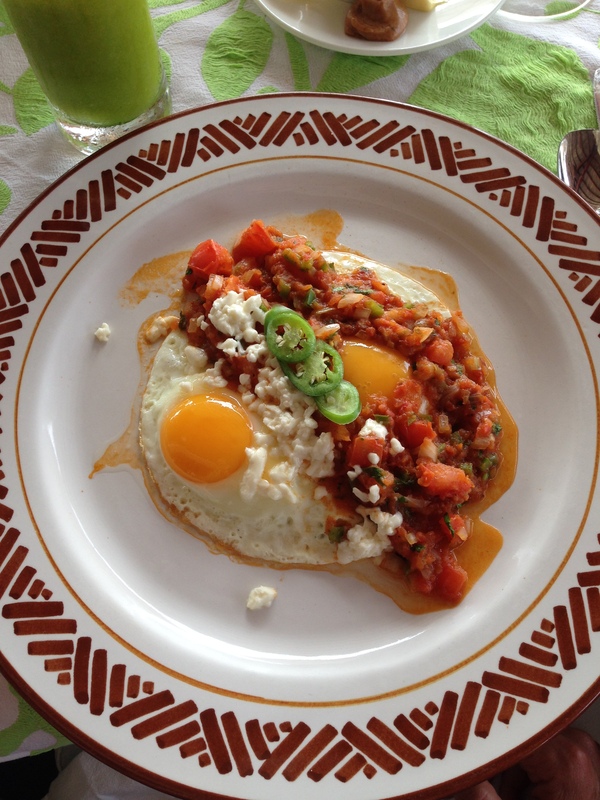 Queen for a Week… Las Ventanas Style! 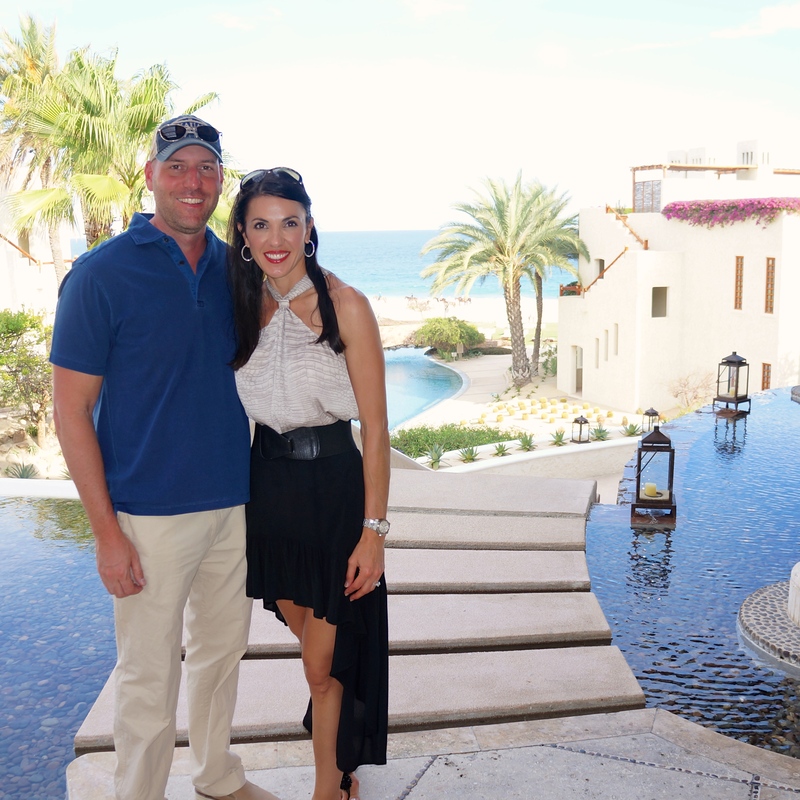 Las Ventanas al Paraiso, a Rosewood Resort, was magical! 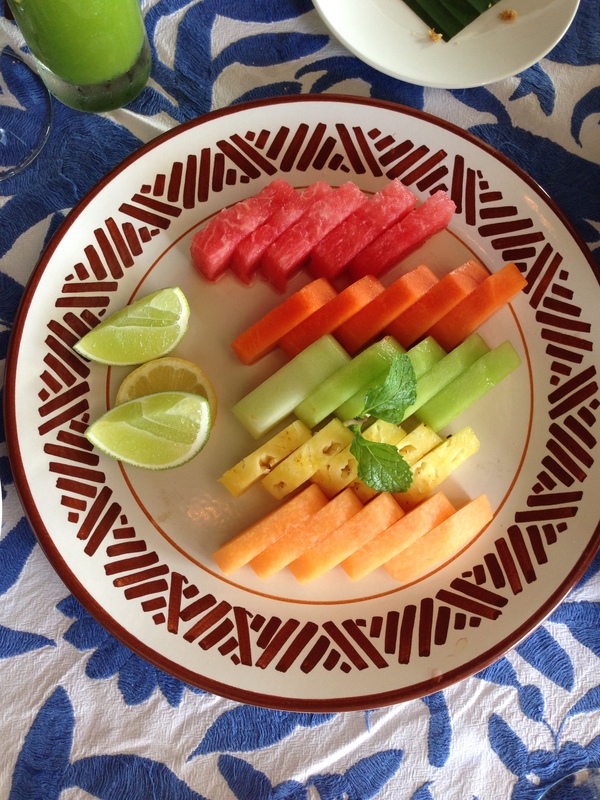 I have stayed in other luxury resorts, but I’ve never experienced this kind of extra special attention to detail before, from the moment we were chauffeured in a black car from the airport, with wifi, snacks and a cold cerveza I must add. Once we reached the beautifully manicured resort, we were promptly greeted by some of the staff with a cupcake and a candle, just for me!!! After meeting our personal butler, we were whisked away for a relaxing neck massage while our luggage was being delivered to our rooms! 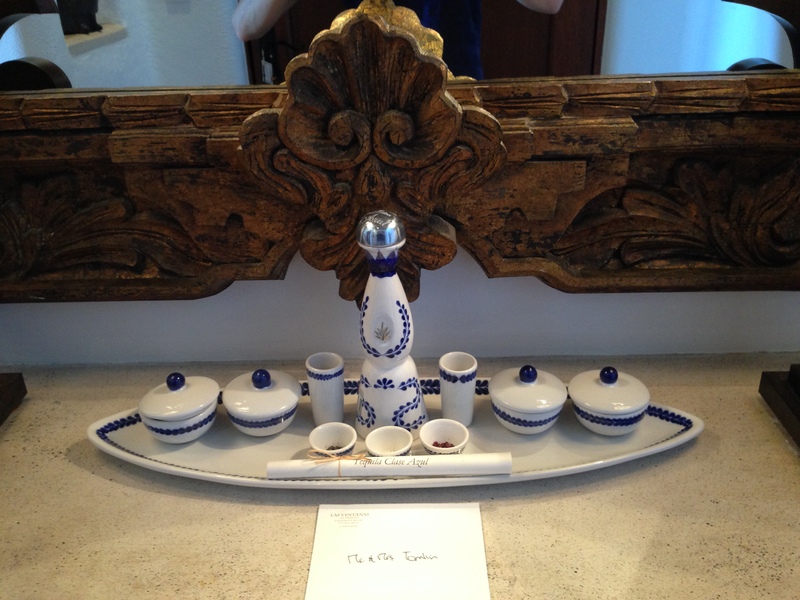 In our room, we were pleasantly surprised with a complimentary bottle of tequila and snacks to enhance the flavors. Olé!! 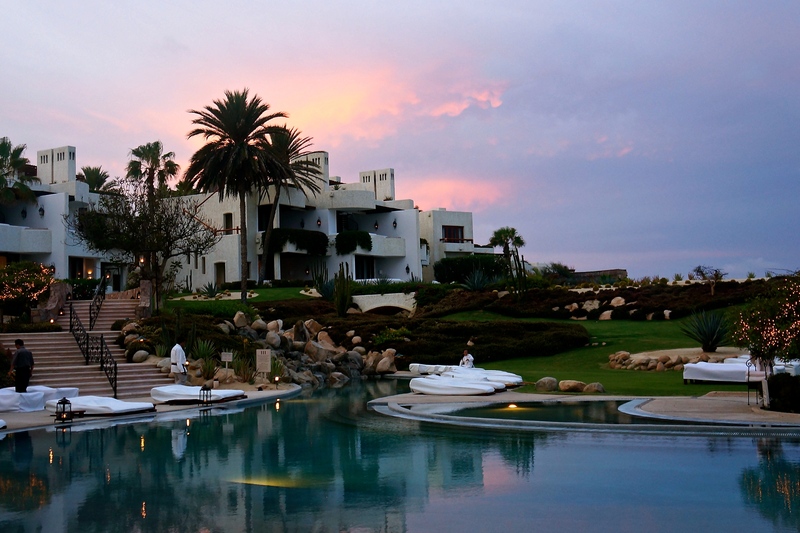 The many pools were crystal clear and perfect for a cool dip after soaking up the rays on the comfortable lounge chairs. Poolside service was impeccable with perfectly mixed drinks and food. They also served free samples of drinks and snacks throughout the day! 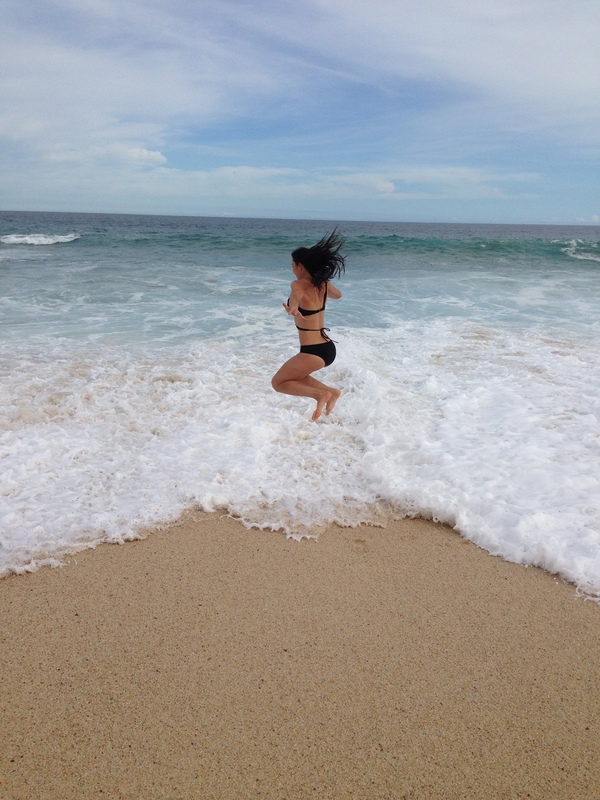 In case you didn’t know, swimming in the Sea of Cortez is not recommended since the riptide is so strong. Though walking the beach is highly encouraged!! 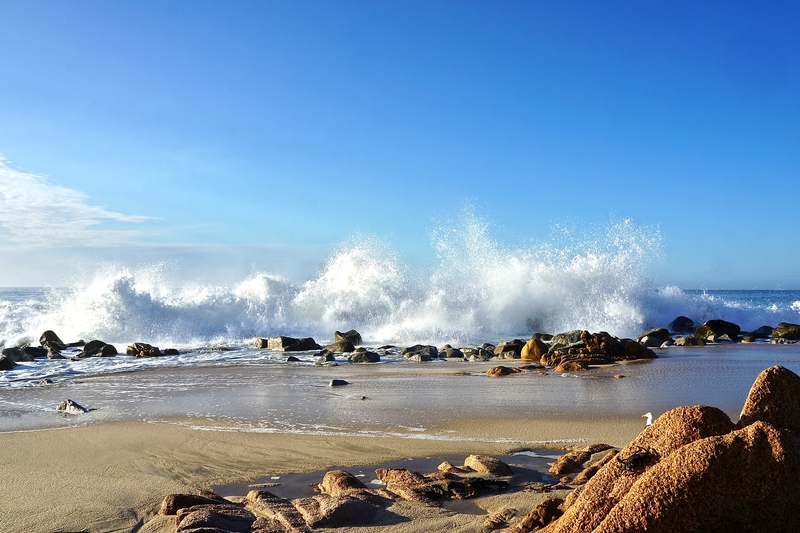 I loved strolling along the beach, watching and listening to the powerful waves. 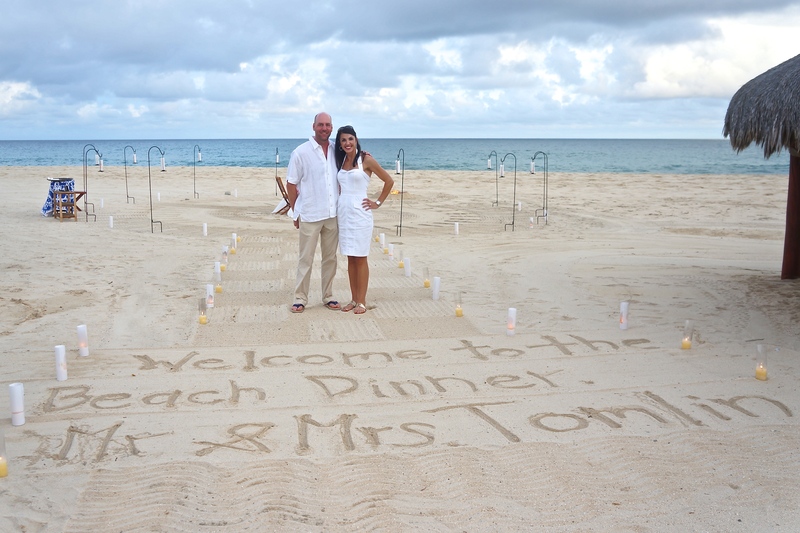 We had a private dinner set up on the beach just for us!!! 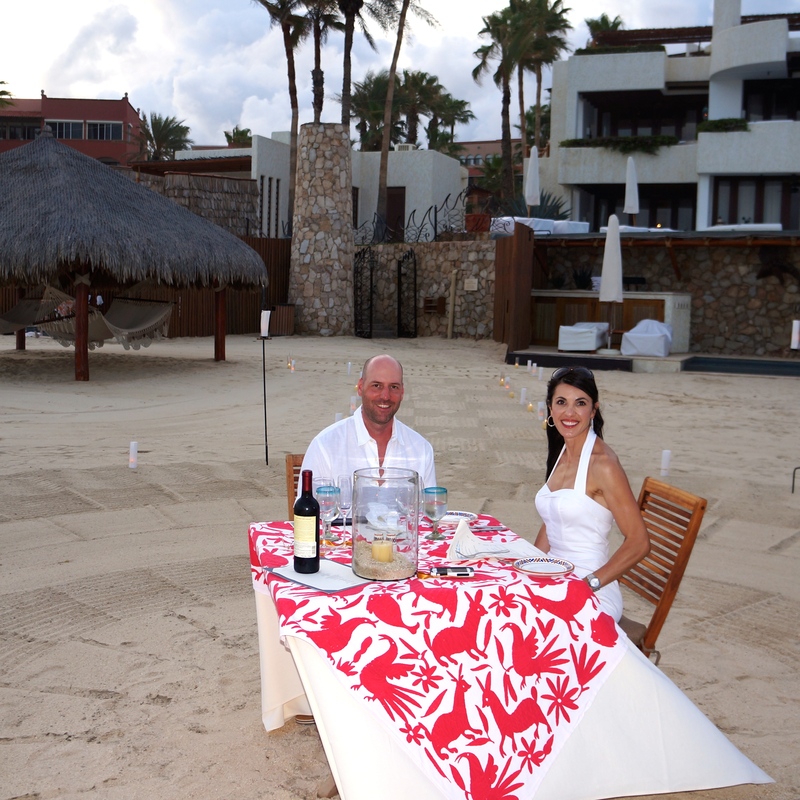 Beautiful handcrafted tablecloth for our Beach Dinner table. 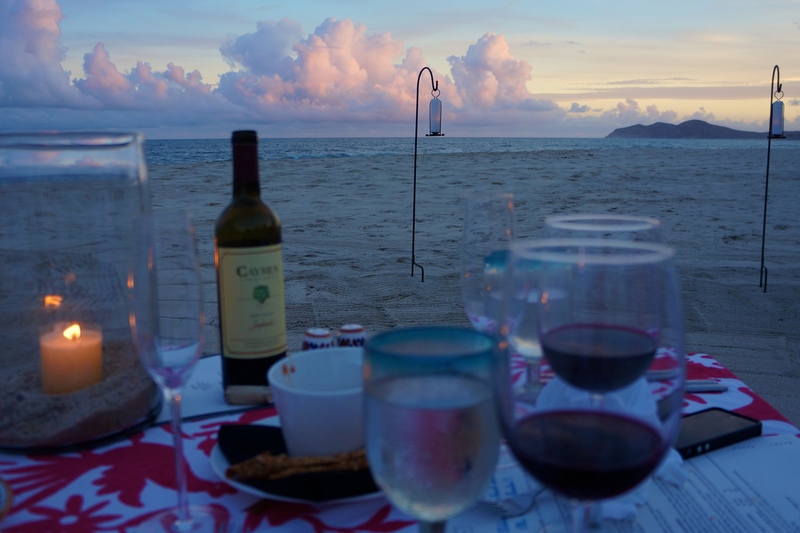 Candles were set up all around our private dinner setting…A bottle of Caymus Zinfandel complimented our meal perfectly! 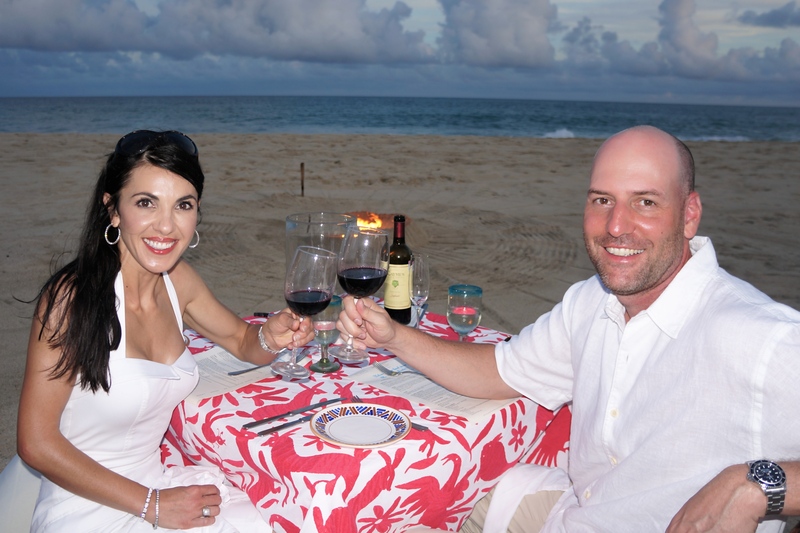 Cheers to many more happy times spent with this fantastic man! We never thought of going elsewhere for any meals. We were perfectly satisfied with the fresh offerings from the chefs at the 3 restaurants on site that we very much enjoyed! 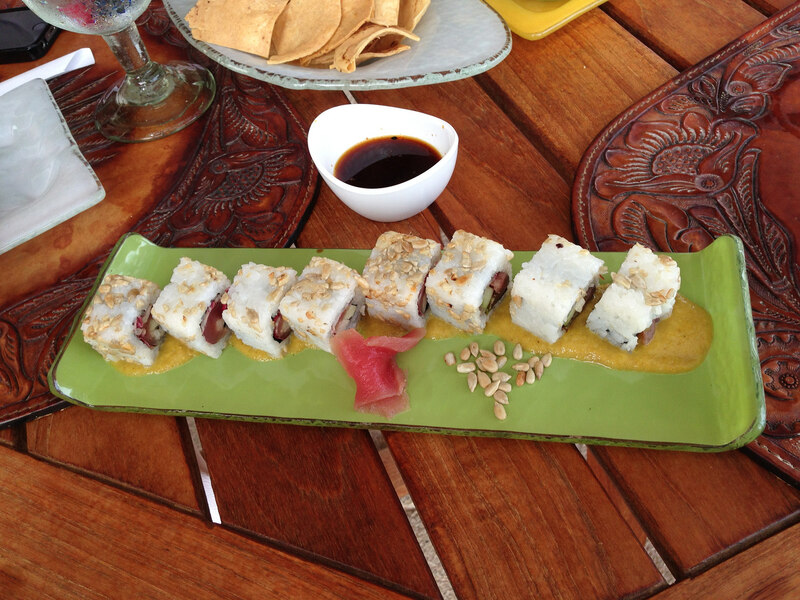 One afternoon, we enjoyed a personal tequila tasting at the Tequila, Ceviche & Sushi Bar including blanco, reposado, añejo, and extra añejo varieties. 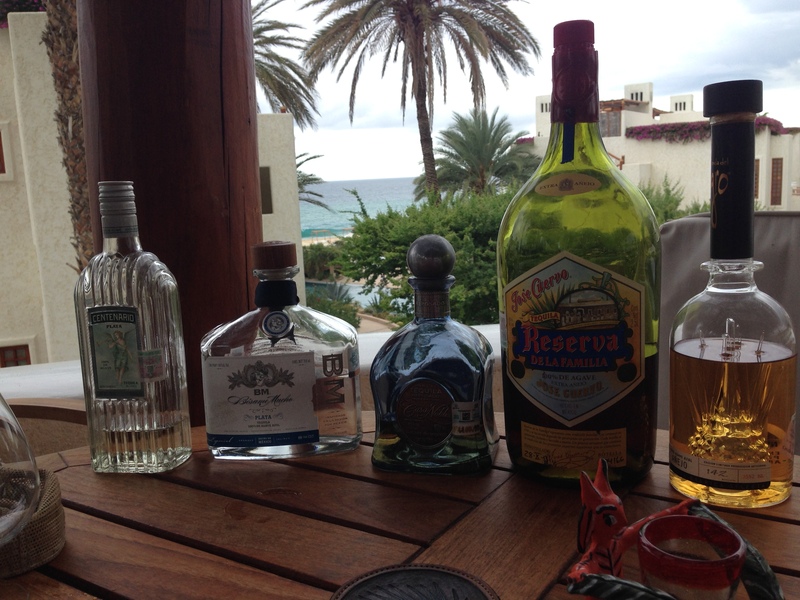 Did you know that tequila tastes great sipped, from miniature looking wine glasses, instead of taken as shots? That is, tequila that is made 100% from the Weber blue agave plant (a member of the lily family and not a cactus as it is sometimes assumed) that’s grown in central Mexico in the lowlands and highlands around the town of Tequila itself, like George Clooney’s, Casamigos Tequila. 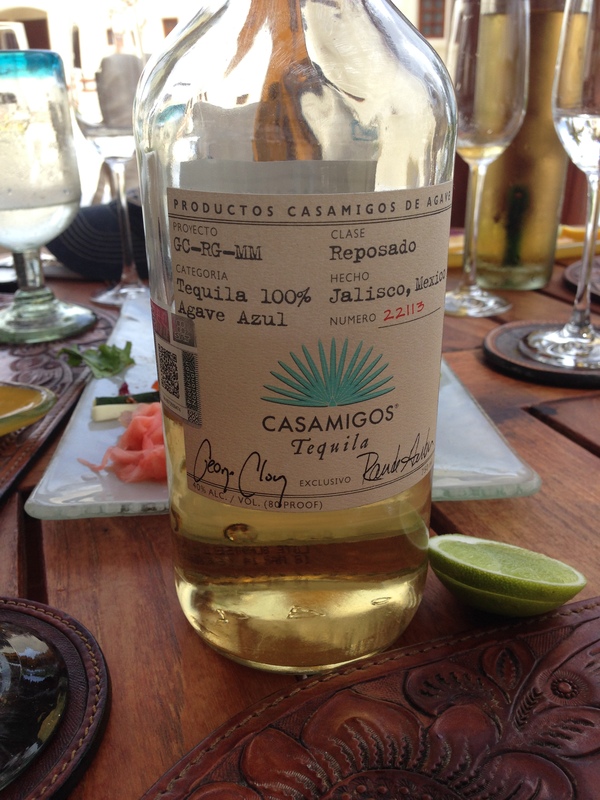 Creators of Casamigos Tequila: George Clooney & Rande Gerber. I can’t forget to mention the extremely relaxing 90 minute massage where I got to choose not only the scent, but also the music: Gregorian Chants is what “spoke” to me at that time 🙂 It was ammmmazing!!! 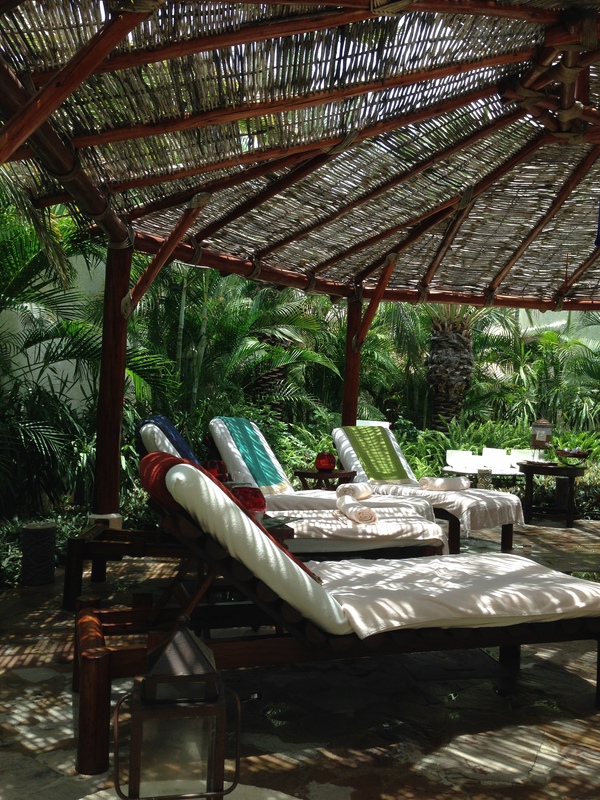 The Spa is well appointed with all the amenities one might need to freshen up after a relaxing experience. 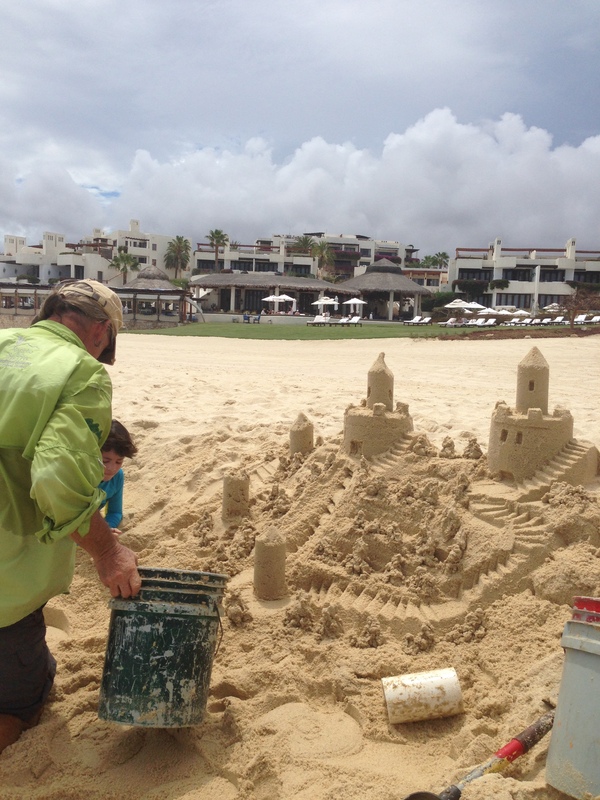 In front of the resort, I came across a young boy building a neat looking sandcastle. He was actually be taught by a local sandcastle artist 🙂 Not a bad way to entertain younger kids, though I definitely enjoyed watching! 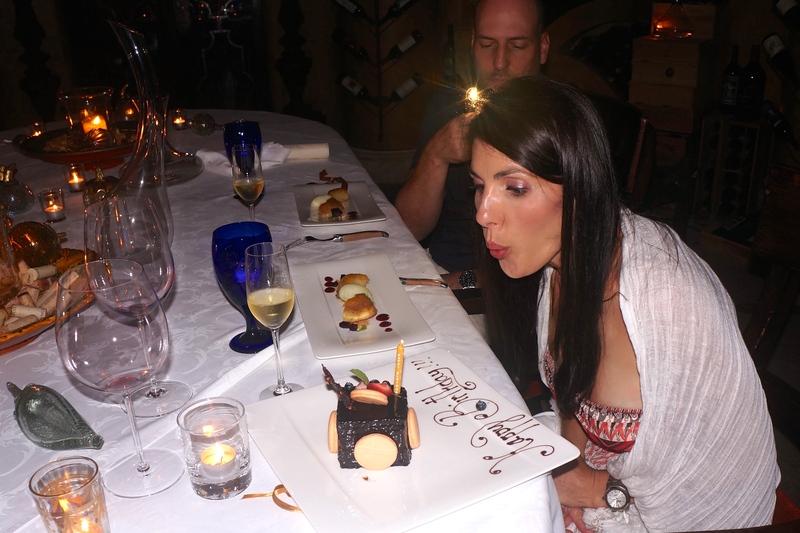 We celebrated my birthday in “La Cava” where we were served a fantastic menu including wine pairings. They also created a decadent birthday cake with macarons on the sides, for me! 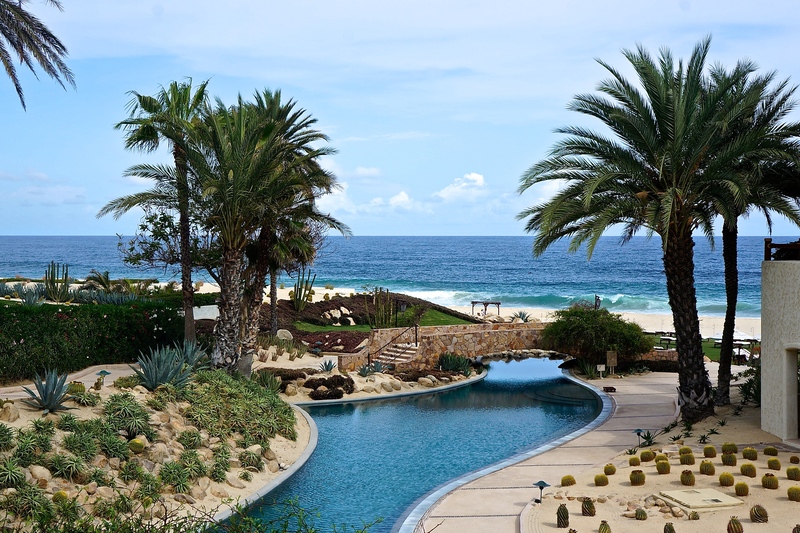 The way to celebrate 4th of July Las Ventanas style in Cabo! Now, since my birthday happens to be on July 4th, I always get fireworks here in the States. 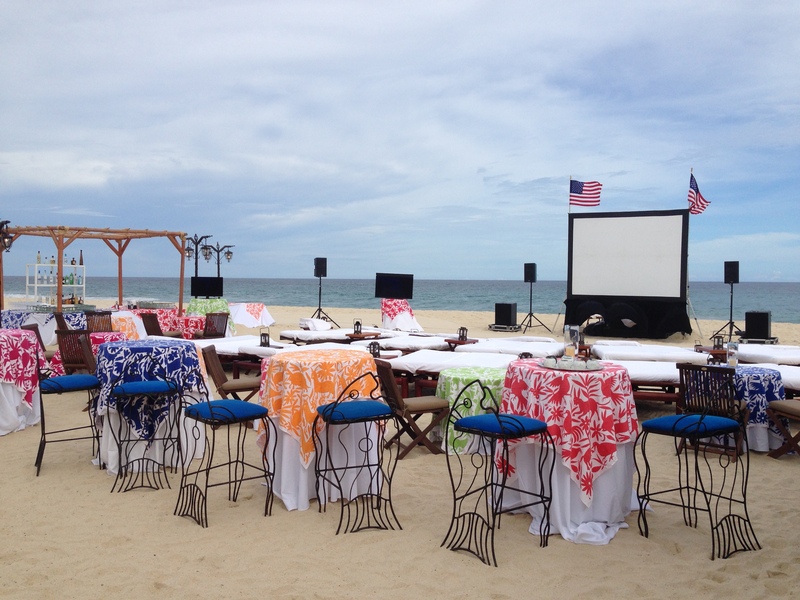 I didn’t know what to expect while in Cabo… The resort put on a fun Independence Day event, on the beach. It included comfortable seating, delicious food & drinks, a movie on a big screen and last but not least, a booming fireworks display!! 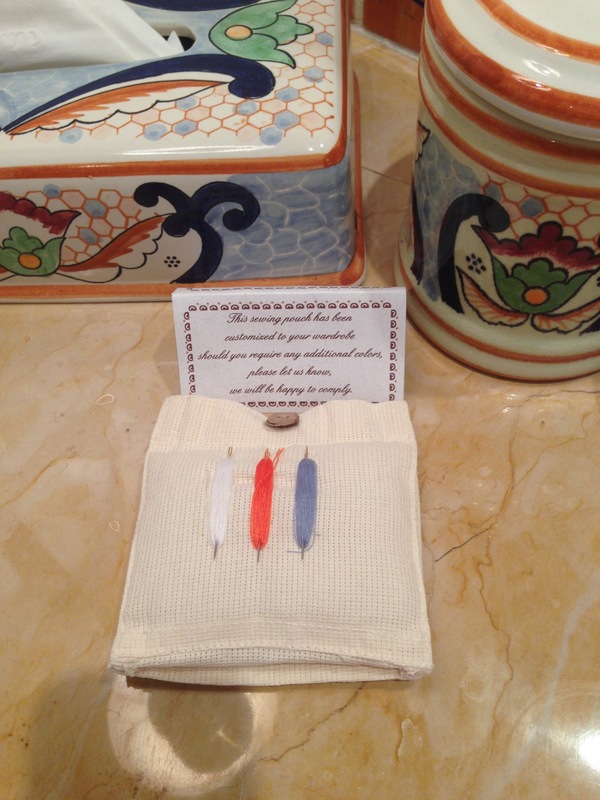 Have you ever been presented with a custom sewing kit, with perfectly threaded needles that coordinate with your clothes?? 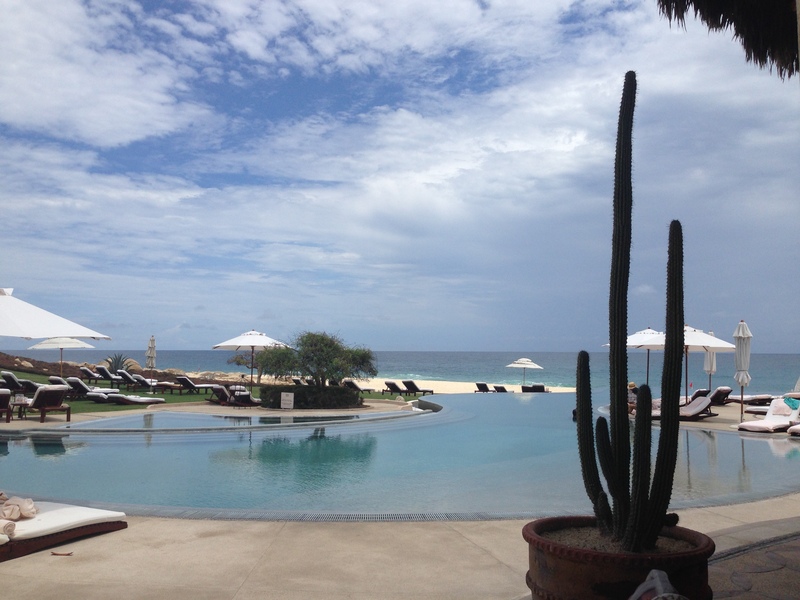 Me neither, until Las Ventanas! I actually used the blue. 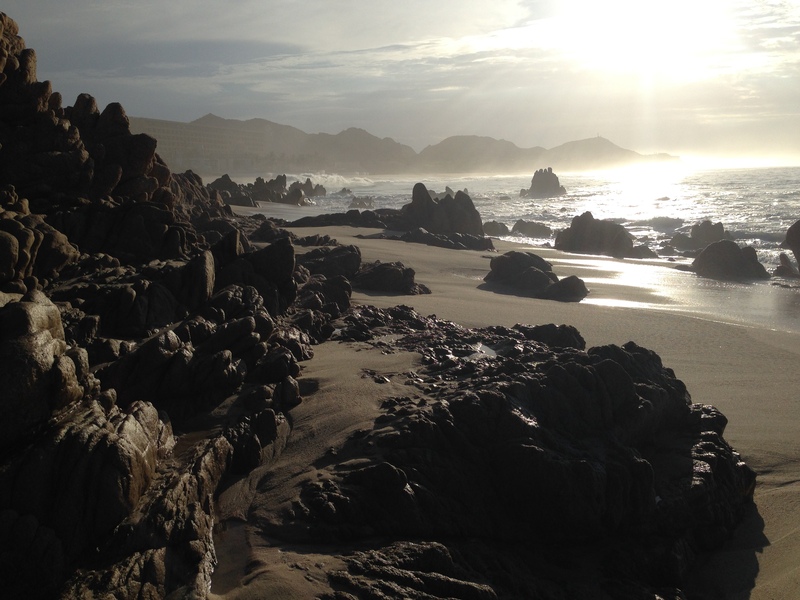 I loved walking the beach! Everyday it was a different experience. We had an early morning walk that was so fun! Kenny set the bar way high for birthday celebrations! I LOVED it and will always remember this fantastic experience he planned for me. 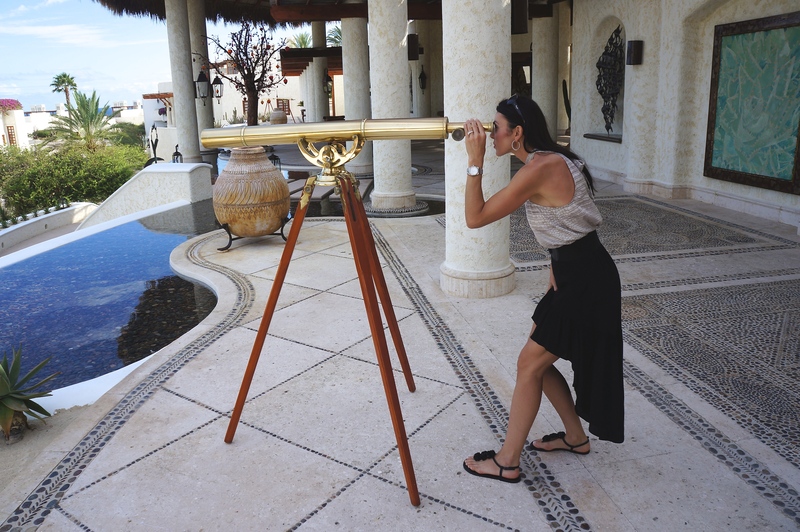 I can’t wait to return to Las Ventanas especially since Austin offers direct flights!!! Olé! !